Dr. Mohammad Najeeb Azizi has a Ph.D in Economics, MSc in Development Economics and is a former fellow at Stanford University and UNITAR. Previously, Dean/Associate Professor at Kabul School of Economics and Executive Director of Afghanistan Information Management Services leading the teams of Mobile Innovation and Program Management, Civic Education, Geo-spatial and Knowledge Management. Former CEO with Infinity Afghanistan. Facilitate team building for short- and long-term assignments for Afghan government, USAID, World Bank, UN, academia and private firms. Six telecommunication companies in Afghanistan manage the 5,900 total towers. Of those that are known to be facing threats, the towers distributed across the southern, south western and eastern regions of the country dominate. According to the Telecommunication Director of Helmand province, Omeed Zaheer, there is a total of 180 cell towers, run by five different telecommunication companies. He says the majority of them cooperate with rebel groups and pay them extortion money. 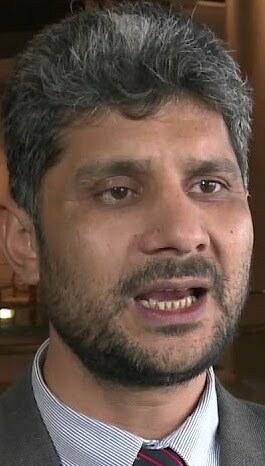 "The telecommunication companies that are active in Helmand province cannot reject the Taliban demands, thus most of the companies are active for 12 hours and do not provide services during the night and disconnect their services at Taliban request," Zaheer said 20150207. He said most of the threats are in the northern districts of Helmand, but that some five districts had absolutely no telecommunication infrastructure. In neighboring Kandahar, the situation is similar. "There are telecommunication networks in Kandahar, but most of them end their services after the evening prayer and we cannot be in touch with our friends and families to see what has happened to them and know how they are doing," complained a Kandahar resident. The Ministry of Communications and Information Technology (MCIT) of Afghanistan was set up in the year 1955. Afghanistan stepped in to the world of electric communication in 1898 by installing a one-to-one wired telephone at Arg Palace (Royal residence) in Kabul. In 1908 a small telephone system with 25-line capacity was installed at the northern tower of Arg Palace. Telegraph service was the next telecommunication facility launched in Afghanistan in 1914. The telegraph installation with 2 KW power using mainly for military purposes has been set up in Babour Bagh (a historical garden in Kabul City, which carries the name of the first emperor of the Mughal dynasty, Zahir-ud Din Mohammad Babour). In 1919, several 50-line and 100-line telephone systems (switchboards) were installed in the Shahi-Du-Shamshera post office in Kabul. For the first time 14 students were given scholarships to get educated in wireless telegraphy abroad. In 1920, another telegraph machine made in Britain was installed in Kabul, which was in use until 1932. Afghanistan became a member of the International Telegraph Union (ITU) on April 12, 1928 (The ITU established in 1865 was renamed as International Telecommunications Union in 1932). In 1930, seven short wave telegraph and telephone machines were purchased from the Marconi company and installed in Kabul, Heart, Mazar, Maymana and Khost cities. Later in 1933, another system with higher power antennas was purchased for the company and installed at the central telegraph building in Kabul. In 1949, an automated relay telephone switch with the capacity of 1,300 lines was purchased and its cable network was completed in 1950. In 1953, another telephone switch with the capacity of 5,000 lines was provided from Siemens company and after completion of the network, it was activated in 1957. Providing stations accessories from Siemens Company, the ministry established telephone links between Kabul and Mazar and between Kabul and Kandahar in 1959. In 1961, a 1,500-line switch was purchased from Czechoslovakia and installed in Kandahar City. In the same year, there was established link between Kabul and Kandahar. Also Kabul was linked with Torkham and southern part of the country. Using 3-channel and 12-channel systems and about 14,000 km timber lifted wire line network in Afghanistan at that time, telephone communication services were provided across the country. The ground links were also used for international and transit calls with some neighboring countries Pakistan, Iran and Turkey. The total number of the channels that time exceeded 120. Due to increasing demand for telephone services, a network expansion plan was launched in Kabul City in 1964. According to which, 3,000 telephone lines were expanded in Sher Shah Mena, 3,000 telephone lines were expanded in Shar-i-Naw, 200 telephone lines were expanded in Policharkhi and 5,000 telephone lines were expanded in the central area of Kabul City. The network was fully activated in 1969. The first international radio transceiver station with the power of 20 kW was installed in Kabul, which linked Kabul-Paris by radio. All international calls were transiting through Paris that time. Later in 1964, one 10-kW radio transmitter and two receiver stations were provided from Philips company (Netherlands) and used to communicate with transit centers in Paris, New Delhi, London and Moscow. In 1973, a network expansion project (the Second Telecommunication Project) was launched with the technical consultation of ITU in Kabul City. By the implementation of the project three automated sub-city switches were installed in Shar-i-Naw, Khair Khana and Microrayan. Providing network equipment from Siemens Company, there have been activated 13,200 new telephone lines in the city. Since 1979, Afghanistan is a member of APT. In mid 70s’s, basic telecommunication services including wired telephone and telegraph were accessible in district levels in Afghanistan. Although the telecommunication system mostly was limited to some government sections, the local residents had also limited access to the services. In the last 2 decades (80s and 90s), socio-political upheavals and war not only destroyed Afghanistan’s infrastructures and wealth, but it also destroyed the telecommunication system. The system was mostly demolished and not taken care of telecommunication system. In most part of the country even very essential telecommunication services were not available. After the Interim Government in 2001 established in Afghanistan, the country obtains new horizons of political and socio-economic rehabilitation and reconstruction. During the year 2002, when the Transitional Government and then in 2003 and 2004 when the government was constituted and then elected, along with the process of political stability, the government makes enabling environment for private sector to enter the rebuilding spheres of Afghan lives by approving the privatization system officially. Due to geographical location of Afghanistan which most parts of Afghanistan is surrounded by mountains and a large number of Afghan people scattered in and out of Afghanistan made the telecommunication services and facilities a necessary issue for Afghanistan’s immediate reconstruction. Since 2001 the Ministry of Communications and Information Technology (MCIT) was the first among the new political bodies of Afghanistan to design new strategy and policy for the sector the implementation of which enables the private organizations and companies to take care of the telecommunication system and invest in Afghanistan.